Most brides imagine this moment being a surprise, leaving you in the position to guess their ring size. The most accurate way to size a ring is having it done at your jeweler on her finger. However, if that isn’t an option for you, avoid that unwanted stress and try some of our suggestions below. Did you know: Most people’s right ring finger is slightly larger than their left. This is because most people are right handed, therefore using that hand more often. Try Her Ring on Yourself. One day while she isn’t around, go ahead and slip one of her rings on. Remember that each finger varies in size, so if you can, take note of which finger and which hand she wears it on. You will get the most accurate estimate based on a ring she wears on her left hand. With a pen, trace a line below where the ring falls on your finger. When you go to your local jeweler, they will be able to fairly accurately tell what her ring size is based on that line. Trace the Interior of Her Ring. Aren’t planning on going to the jeweler on the same day? Carefully trace the inner circle of her ring on a piece of paper. Then, simply bring it to an expert who will be able to help determine her size. Another option would be to print our complimentary ring sizer, carefully cut it out, and align it with your tracing. Don’t forget that when you print, choose to print to ‘actual size’ to prevent any distortion of the actual sizing. Grab a bar of soap. It’s time to put those mini soap bars you’ve collected from your stay in hotels to good use! 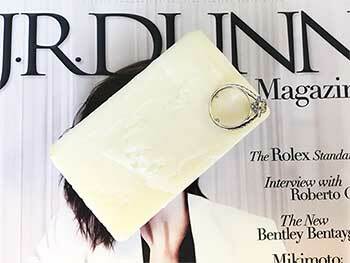 Press one of her rings into a bar of soap, making an impression of the size. Be sure to carefully rinse it off before placing it back. Also, don’t leave the ring imprinted soap around for her to see. From there you can match the inside of the imprint to our printable ring sizer or bring it into your jeweler for a size estimate. Ask Those Who Know Her Best. 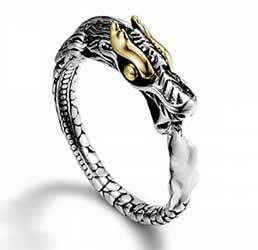 Gift Her a Fashion Ring. For an occasion such as a birthday, Valentine’s day, or even Sweetest day, find an excuse to give her a more affordable fashion ring such as this classic John Hardy ring. This will give you an opportunity for a ‘trial run’ in choosing her size. Try out something around the average ring size range of 6 to 7 for starters. When you give it to her, you will be able to determine whether this size was a good fit, giving you guidance to size up or size down for the upcoming proposal. Most stock rings come in a size 6-7, which is around the average woman’s ring size—based on a 5’6” and 140lb. woman. Depending on how slender her fingers are, adjust a half size or two up or down from there to make an educated estimate. If you are still wary about ruining the surprise, it is always safer to go with a ring size a little on the larger side. Then you can always have it sized down at your local jeweler to perfectly hug her finger. Trusting your jeweler to assist you with this obstacle is key. Our J.R. Dunn team help people just like you with this exciting moment all the time and are dedicated to making it a stress-free experience.